Professor Dr. Dr. h. c. mult. 1952 Bachelor of Science, Faculty of Science, Hiroshima Univ. 1961 Doctor of Science, Hiroshima Univ. 1961 - 1962 Lecturer, Yokohama National Univ. 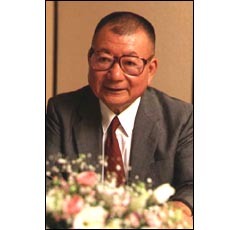 1962 - 1973 Associate professor, Yokohama National Univ. I. Treatises Miyawaki, A. 1955. Habitat Segregation in Aster subulatus and three species of Erigeron due to soil moisture. The Botanical Magazine 68(802): 105-113. Tokyo. II. Books Miyawaki, A. 1970. Plants and Humans. 窶稗alance of Biocoenosis窶� 230pp. NHK Books 109. Japan Broadcast Publishing, Tokyo. (Japanese). Miyawaki, A. & Ikeda, T. 2011. Messages for the Next Generation. 窶疋ialogue about the quality of nature and human life窶�. 256pp. Jiyusha, Tokyo. (Japanese). III. Editorial Work Miyawaki, A. & Tﾃｼxen, R. (eds.) 1977. Vegetation Science and Environmental Protection. Proceedings of the International Symposium in Tokyo on Protection of the Environment and Excursion on Vegetation Science through Japan. 578pp. Maruzen Co., Tokyo.